boards using a FOSSIL including PCBoard/M. RIPscrip on the remote. New InKey Function. DoorFrame v3.1 Doors development library for BASCOM/PDS 7.x. 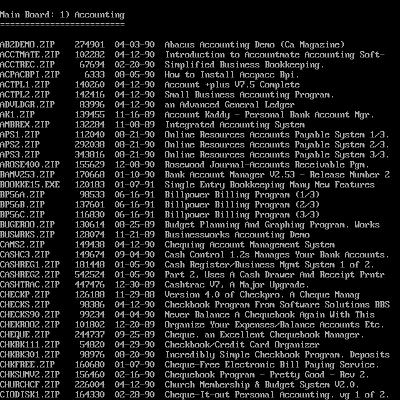 Has direct support for most BBS software, COM 1 – 4, up to 115K Baud, non-standard IRQ’s, multi-nodes, music, high score bulletin, box and line drawing, etc. risk as to the results and performance of the program is assumed by you. damages resulting from the use or inability to use this product. after which you should either register your copy or discontinue usage. utilizes some of the routines contained in Tom Hanlin's PBClone library. The COM routines are handled by the QBSerial I/O library. NOTE: A version of DoorFrame is also available for Quickbasic 4.x. and list it's parameters (if any) without the enclosing parentheses. PARAMETERS: SROW% - ROW the box is to start at. Valid numbers are 1 - 22. Accepts an INTEGER number or variable. SCOL% - COLUMN the box is to start at. Valid numbers are 1 - 79. EROW% - ROW the box is to end at. Valid numbers are 2 - 23. ECOL% - COLUMN the box is to end at. Valid numbers are 2 - 80. BTYPE% - Type of border. Accepts an INTEGER number or variable. 0 = No border (spaces all the way around). 1 = Single line all the way around. 2 = Double line all the way around. 3 = Double line on sides, single on top and bottom. 4 = Single line on sides, double on top and bottom. FFG% - Foreground color of the box fill characters. FBG% - Background color of the box fill characters. FCHAR% - ASCII number of the character to fill box with. SHADOW% - -1 = no Shadow, 0 - 7 = Background color of the Shadow. TITLE$ - Displays a title centered on the top border. Accepts a STRING variable or QUOTED TEXT. bottom right is ROW 23, COLUMN 80. DESCRIPTION: Backspaces NUM% from the ROW% and COL% specified. 0 = Clear both buffers. 1 = Clear communications input buffer only. 2 = Clear keyboard buffer only. the BGC% parameter. NOTE: Does not work in non-ANSI. color is specified in the BGC% parameter. NOTE: Does not work in non-ANSI. ground color of your choice. Range is 0 - 7. ANSI only. PARAMETERS: SEC%, 1, 2, Etc. or not, see the MODE% variable for that. PARAMETERS: MSG$ - Text to be printed in either variable or quoted form. Example: "Print this" or MSG$ = "Print this". INTEGER number or INTEGER variable form. BLINK% - Enter 1 for blinking text or 0 for normal text. Accepts INTEGER number or INTEGER variable. beep. Does not beep on the local computer. disable. Accepts INTEGER number or variable. NOTE: XPOS% is ignored when GRAPHICS% = 0. NOTE: YPOS% is ignored when GRAPHICS% = 0. 0 to position the cursor after the last character. CENTER% - Enter 1 to center the line or 0 for no centering. CAPS% - Enter 1 to convert text to all uppercase. Enter -1 to convert text to all lowercase. Enter 0 for no case conversion. CODES% - 0 = No color codes in this statement. 1 = Color codes are present in this statement. DESCRIPTION: Displays text to both the Local (if on) and Remote screens. senses ANSI capability on the remote end. %*}test} displays 'text' in low intensity white and blinks. DFDEMO.BAS file for examples on using this option. routine doesn't have to search for and strip these characters. PARAMETERS: YN$, "Y", "N", "G"
You can toggle this ON, "Y" or OFF, "N" when you call EXIT.DOOR. Accepts a STRING variable YN$ = "Y" or quoted text "Y". DOS Error Level of 1 for Wildcat! systems and 62 for all others. routine. It will return a value in RESPONSE$. DO WHILE RESPONSE$ = ""
or variable. 0 = any length. to the calling routine and RESPONSE$ will contain "-1"
IFG% - Foreground color of the response (INTEGER). IBG% - Background color of the response (INTEGER). AUTOCR% - 1 = Automatic CR, 0 = Wait for ENTER to be pressed. Text$ - Text to display (if any). Use "" for no display. X% - X coordinate to display text. 0 = current coordinate. Y% - Y coordinate to display text. 0 = current coordinate. Show% - 0 = Don't display response, 1 = Display response. IF UCASE$(RESPONSE$) = "Y" THEN Etc., Etc. when ENTER is pressed). The response would not be displayed. routine and RESPONSE$ would contain a "-1". line, then it reads the BBS interface file PCBOARD.SYS, etc. PROGNAME$ = "Name of your Door"
your program minus the .EXE extension. -> NOTE: EXENAME$ MUST BE NO MORE THAN 7 CHARACTERS! PARAMETERS: SROW% - Row the line starts at. Valid numbers are 1 - 22. SCOL% - Column the line starts at. Valid numbers are 1 - 79. LEN% - Length of the line. Max. of 23 for vertical, 80 horiz. make the ends of the line match the box border. MID% - Type of line. 1 = Single line. 2 = Double line. EFG% - Foreground color of the ends (see color table). EBG% - Background color of the ends (see color table). MFG% - Foreground color of the line (see color table). MBG% - Background color of the line (see color table). PARAMETERS: HI.SCORE&, 10, 10000, Etc. TUNE$ = "t110 l8 ms d4 mn o3 g a b o4 c ... "
come across his screen (not a pretty sight!). PARAMETERS: LF%, 1, 2, Etc. PARAMETERS: FILENAME$ - STRING variable or quoted text of file to SEND. YN% - 0 = Do not use the ENTER prompt after last page. 1 = Use the ENTER prompt after last page. CLR% - 0 = Home cursor, do not clear screen. 1 = Normal clear screen. handy for displaying Help files, Welcome screens, etc. than using the regular save function (ALT-S). INTER% - 0 = User can interrupt and exit the screen anytime. 1 = User cannot interrupt file until it is finished. SHOW.BLT "Y" will ask if they want to see the Bulletin. SHOW.BLT "N" displays the bulletin without asking. choosing when CALLing the DIS.PLAY subroutine. C:\BBS\USERINFO.DAT <- For Wildcat! 3.x+ systems. C:\BBS\DORINFOx.DEF <- For QBBS/RBBS/RA. Replace x with Node #.
. so you may add whatever is necessary. NOTE: See Miscellaneous Notes for info on using Environment Variables. respectively. Both variables will default to 1. ALLOWEDBYTES& Allowed D/L bytes from the PWRD file. * BAUDCONN$ Connect rate of caller or "LOCAL"
CHATSTATUS$ Chat mode status. "U" or "A"
EXPERT$ Expert mode - "Y" or "N"
should kick him back out of the door. by setting this to -1. OWNER$ Name DoorFrame is registered to (if any). SERIAL$ Your DoorFrame serial #. String variable. path/filename of line 1 in the .CFG file. give this a positive value. TIMEOUT% Programmer supplied keyboard timeout. Defaults to 300 (5 mins) if not specified. 32,767 since it's an integer. NOTES: Variables marked with '*' are provided for information only. be used plus the following additional variables. DAILYDNLDBYTES& Bytes downloaded so far today. LASTCONF% Conference number last in. NOTES: These variables are all passed back to PCBoard. * COMPORT% COM port number (0 - 15). EXFROM% Conference exited to Door from.
! LASTSCAN$ Date of last directory/new files scan. SECREM$ Number of seconds remaining this call. not specified. Has a minimum of one min. Varialbes marked with '!' are available only in the 52 line version. * ANSISUPPORT$ 'Y' or 'N' for ANSI enabled. * COMMAND.LINE$ Started with a CommandLine switch. Y or N.
* DATABITS$ Databits, 7 or 8. DOOR.DL& Number of files DL'ed in the door. All other variables are taken from the DOOR.SYS file. * BAUDRATE$ Baud rate and parity of caller. NOTE: RBBS adds baud rate of BBS. DISPLAY% Defaults to -1 (ON). * DORINFO13TH$ 13th line available only on RBBS systems. Use DETECT.ANSI to determine this. NETWORK$ Network type. DoorFrame reads/writes as is. * NODENUM% Number of this Node. * ALREADYCONNECTED$ "TRUE" or "FALSE"
* CONSOLE$ "LOCAL" or "REMOTE"
* DOORNUMBER$ BBS number of this door? * ENTERDOOR$ Time caller entered door in HH:MM format. * MNP$ "MNP/ARQ Connection" or "Normal Connection"
* TIMEOFF$ Time caller exited from the door. when caller logged on to the BBS. when caller entered the door. Check DFRAMEX.INC for an explanation of variables not listed above. DoorFrame requires DOS 3.x and up since all files are opened in SHARED mode. When using PCBOARD.SYS, DoorFrame also accesses the USERS file. The DOOR.SYS used by DoorFrame is the standard 52 line GAP (tm) file. The CALLINFO.BBS used by DoorFrame currently contains 36 lines. right after you call INITIALIZE. to DFRAME.ERR. Your Door will then exit back to the BBS. PROGNAME$ = "Name of the Door"
EXENAME$ = "FILENAM" <- NOTE: Max of 7 letters! exit back to the BBS. Defaults to 300. OWNER$ = "Your Name" <- For registered DoorFrame users only. MAKE.BLT HI.SCORE& <- If you want one generated. SHOW.BLT "Y" <- If you want to show it before door closes. file is left open so you may read additional lines from the .CFG file. the start of your program. of input for those callers who cannot use their arrow keys. interpreted as arrow keys when SysopKeys% = 1. Turning off the Status lines. screen to show, you may blank those out at any time with the following. To turn the Status lines back on just set No.Status% = 0.
that allow you to do this. After calling INITIALIZE, set Auto.Recycle% = 0. VERY CAREFUL when using this option. Make sure you TEST IT THOROUGHLY!!! the door as you normally would. FOOBAR FOOBAR.CFG /%IRQ% for the environment variable. is normally used with COM1. No /x parameter is needed for the standard IRQ's.